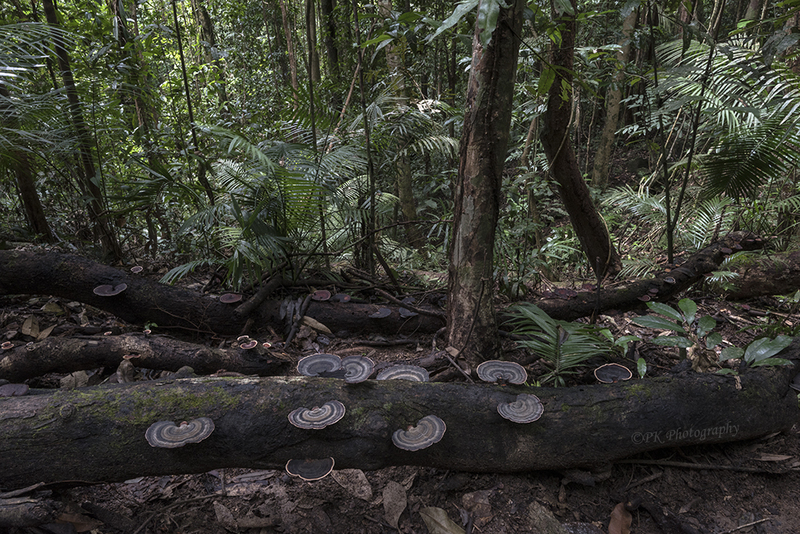 These semicircular bracket fungi, bedecked with variegated growth rings, will eventually consume the fallen tree and return its nutrients to the forest floor. Looks like those fungi have plenty of wood to digest! Yes! I wonder how long it will take to digest that log alone. Those look interesting. Do you have any macro (or closer) shots of their texture/design? I did have my macros with me on the trip, but I had left it behind in order to lighten my load on this guided hike through a protected rainforest. It would be interesting to see closeup detail in the textures, which I learned in reading about the bracket fungi for the post are actually growth rings like trees have. I found this . . . I don’t think I’ve seen them in real life or if I did, I didn’t take note of them. Thanks for sending the link. I feel I’m often anxious to photograph something in nature based solely on its visual appeal and only later find out what it is and how it lives. The polypore is one of those subjects! A profound expression of life! I name all my forest floor pictures Cycle of Life because it is so obvious there.